Swimsuit model Chrissy Teigen is super into food—and not just alfalfa sprouts and lemon water. The Utah-born model with Thai roots has a drool-worthy recipe-filled food blog, an epic Instagram following where she charts her kitchen trials and triumphs, and now a cookbook (published by Clarkson Potter/Penguin Random House), Cravings: Recipes for all the Food You Want to Eat—think Frito Pie Bar, Dump and Done Ramen Salad, or French Toast Casserole with Salted Frosted Flakes. Teigen collaborated on this debut cookbook with Jewish food writer and recipe developer Adeena Sussman: Teigen even calls Sussman “her other everything” (her “first everything” being her husband John Legend). 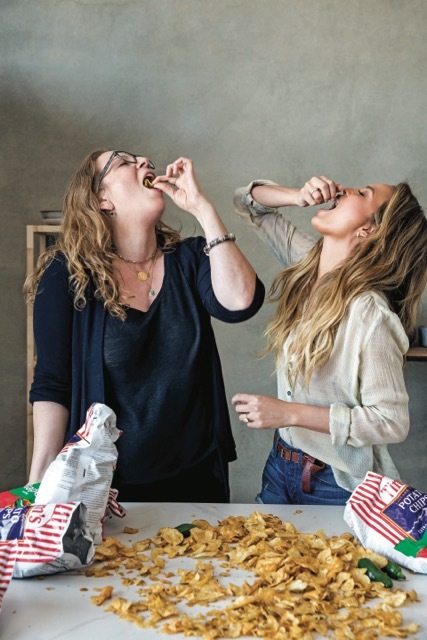 In addition to stories on bubbe’s chicken soup for Martha Stewart Living or kosher quinoa for Gourmet magazine, Sussman previously co-authored cookbooks on fried chicken and on puddings, so what seems like an unlikely duo at first glance makes more sense when you consider Teigen’s professed love of “sober stoner” food. In fact the two got along so well Sussman moved in with Teigen and Legend for days or even weeks at a time while the two worked on the cookbook over the course of a year. We caught up with Sussman this week for a behind-the-scenes look at how it all went down. Lara Rabinovitch: I like how Teigen says in the cookbook that she’s not going to be that annoying model that says she can eat anything she wants. Adeena Sussman: I can tell you that she eats. She enjoys her food. She just has good eating habits: she knows when to stop. She also has a really, authentic populist streak. She’s a real person. You feel like she’s your friend. At the same time, what draws me to this book is how brilliant and funny the writing is. She really wrote this book. It was important to her to write it. She turned in really great copy. And every recipe in the book she had a hand in making. She was there. She didn’t phone it in. So you lived with her while you were testing these recipes? Yes. I flew out to Los Angeles many times—she was very devoted to the project. She would text me ideas, then we would brainstorm together, then cook them together. The cooking part was really fun. So walk me through a day with her…. Well, the book is called Cravings. Chrissy would wake up and think about what she was in the mood to eat that day — and it’s based on what’s going on in her life. If she’s getting ready for a Sports Illustrated shoot she doesn’t stop eating, but maybe she’ll eat lower carbs or more salads. But low carb still means delicious, juicy chicken, and a really great salad dressing that has oil in it, and avocados. She strikes a really great balance. There’s everything from scallops to Stove Top stuffing. It’s a real mix. If we’re being honest most of us eat that way. Everyone likes to sneak in a bag of Doritos here and there, whether they admit it or not. She’s just honest. So, let’s take a step back here. How did you guys meet? It was a sort of unconventional job interview…. I met Chrissy and John late at night at the Bowery Hotel [in New York City]. We hit it off. They’re very cool, very down to earth people. They’re both family-focused people. Was Chrissy at all curious about your expertise in Jewish cuisine? She’s very interested in different cultures, and she loves eating out and loves food. But this book was really based upon what really resonated with her. I wouldn’t say there’s a big Jewish influence but I would say that the Jewish influence is more in the love of cooking and being home in the kitchen, and that as being the focal point of your home. And her mom — I mean she basically has a Jewish mom. Oh my god Pepper [Tegien’s mother, Vilailuck Teigen, aka Pepper]! Pepper lives with them. She’s an amazing cook. I cannot tell you how many times I flew in late at night and Chrissy and John were maybe getting in the next morning, and at 10pm Pepper would make me a homemade Thai dinner. That’s really what she’s like. And that warm touch is really so special. You really feel it in their life. But yeah Chrissy is very curious and interested in trying new things. So I’m wondering about the “Everything” Chicken Sandwich Melts featured in the cookbook, made with everything bagel spice mix…. That was completely Chrissy’s idea, but I may be a little more well versed than her in the ingredients of an everything bagel because of my background. She loves everything bagels. And I love the idea of coating a schnitzel in everything bagel spice. It’s a great fusion. So what’s next for you, after working with a swimsuit model? I’m doing research for an Israeli book project. But not with Chrissy, I’m guessing? No, but they want to go to Israel. They’re very curious about it. They’re culinary travelers. Oh my god I would love to show them around, I’m sure that will happen at some point. Photo reprinted from Cravings: Recipes for All the Food You Want to Eat. Copyright © 2016 by Chrissy Teigen. Photographs copyright © 2016 by Aubrie Pick. Published by Clarkson Potter/Publishers, an imprint of Penguin Random House LLC.